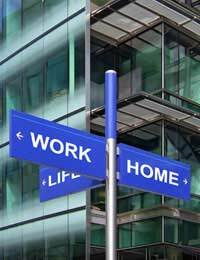 Maintaining a good home/work life balance isn’t easy! Work and home can often make hefty demands on our time and it’s easy to slip into the situation where we juggle rather than manage. For our health and wellbeing, not to mention our happiness, it’s important to maintain a good balance between home and work life. This means getting the right amount of sleep, eating well and getting exercise. If you’re busy with work and home demands, it can be tempting to make cuts in this area. This isn’t wise! Without your health you cannot work and poor health can lead to lack of concentration, low tolerance, and exhaustion (to name a few). Action: Are you getting enough sleep (the recommendation for adults is between 7-9 hours)? When did you have your last check-up? How healthy is the food you are eating? If you can, try to establish regular working times. This means that both your employer and your family know what they can expect and when you will be arriving and leaving. If your job doesn’t have regular hours then good communication is essential so that everyone affected can be flexible. Action: Try to set regular times for leaving home/arriving at work and then for leaving work/arriving home. See if you can stick to these for a week. If there is a big difference between your current work hours and your desired work hours, try to decrease them gradually over a few weeks. Jobs are becoming ever more demanding and it is easy to slip into the routine of regularly working overtime. Do it too many times and your employer will begin to view this as your regular working hours (and expect the same productivity). Be strict with yourself, regardless of the work demands, and try to maintain your regular working hours. Despite your best endeavours, the work demands will always be there! You might also find that you have more energy and are more productive because you give yourself a break from work. Brains need time to re-charge and working long hours has been proven, from research, to make you less productive. Action: Are you currently working excessive overtime? Could you better utilise your normal working hours to have the same productivity in fewer hours? Try to stick to normal hours for one week as an experiment – how do you feel? More productive and more energy? Work and home life can both cause stress and it’s important to keep on top of your stress levels. If you find yourself overstressed try to uncover what the causing factor is. If necessary discuss with your doctor ways to manage your stress. Overwork and juggling too much can cause stress. Managing your time better can help you be more in control and hopefully less stressed. Action: Review some articles on Time Management. Find some areas you could improve. It’s important to understand what needs to get done at home (such as housework, shopping, gardening, budgeting) and how much time each task realistically needs. Household tasks should be spread across all household members fairly; it’s important that everyone agrees what is their responsibility. Not all tasks are essential; prioritise and accept that some activities are nice to do but can sometimes not get done. Action: Create a prioritised to-do list with your household members. Get everyone to agree whose name goes again which task and put it up on the wall. Time Wasters are activities that consume large amounts of time yet are essentially not very important, such as watching television. While watching television isn’t necessarily bad, hours spend in front of the box could possibly be better spent doing something more important. Action: What are your biggest time wasters? How much time could you save by limiting the time you spend on your biggest time waster? If you’re busy, it can seem that work and household tasks consume all of your time leaving little left over to enjoy yourself. This is why prioritising is important. By focusing on those essential activities and forgoing those nice-to-do tasks, you can regain time to spend on yourself and your relationships. Find activities that encourage and promote family/partner time, such as sharing meals together at a table (not in front of the television), shopping together, walking the dog for exercise, or doing the gardening together. Action: Decide on a family/partner activity that can occur regularly throughout a week. Commit to dedicating time to this activity for one week. Then decide if this is something you would like to continue doing.